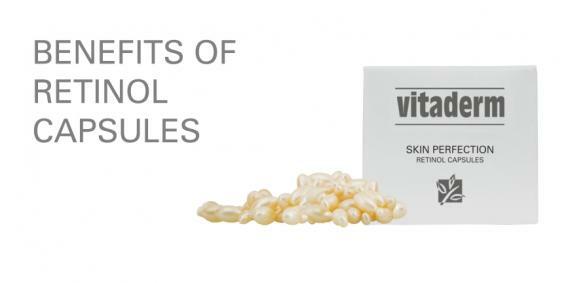 Within a week of using Vitaderm’s Skin Perfection Capsules, your complexion will develop a renewed suppleness, regardless of age or skin type. This high performance product contains Retinol, a potent form of natural Vitamin A, well known for its skin smoothing properties. However, cosmetic products that contain retinol are very susceptible to oxidative degradation through contact with the air around us. Therefore creams and gels containing retinol typically lose their effectiveness as soon as they are exposed to oxygen. Vitaderm’s Retinol capsules are protected against oxidative degradation through encapsulation and therefore retain their effectiveness. WHAT ARE THE BENEFITS OF USING PRODUCTS CONTAINING ENCAPSULATED RETINOL? Skin looks clearer and more even-toned. Enhances the skins own repair process. The results are cumulative. Generally the incredible velvety appearance that the complexion develops will last for the double the period of time that the product was used for. In other words, if retinol was incorporated into the routine for a period of 3 months, the results will generally last for a total of 6 months. WHEN IS THE BEST TIME TO INCORPORATE RETINOL INTO MY SKIN CARE ROUTINE? Since Retinol can cause sensitivity in certain individuals with long-term use, we suggest that the Skin Perfection Capsules are used for 3 months during Autumn and for 3 months during Spring. Using retinol products during winter in a harsh, dry climate may produce symptoms of sensitivity. Vitaderm’s Skin Perfection Retinol Capsules are available at a special price during March. Please contact us for more information or for a stockist in your area – info@vitaderm.co.za or +27 21 914 3777.